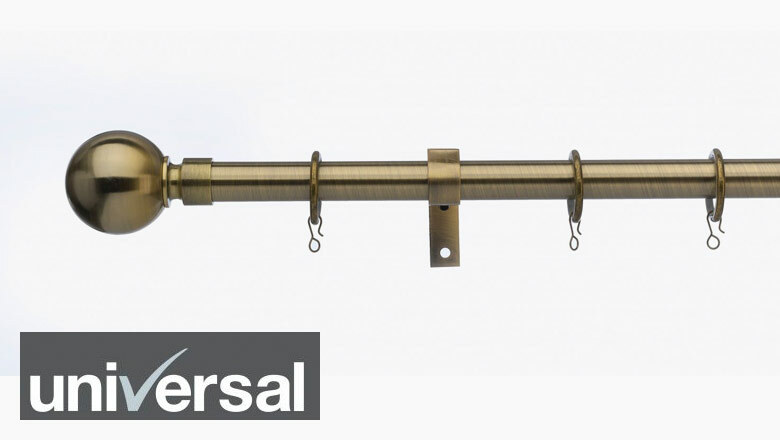 The Universal bay window curtain pole is available in a 28mm diameter with a ball finial in a satin steel, chrome, antique brass and black finish. The pole is available in 2 sizes: for bays up to 300cm and 500cm. The Jones Cosmos bay window curtain pole is suitable for bay windows up to 480cm and is available with a ball style finial in chrome, antique brass, black nickel and matt nickel. The pole kit includes 2 x 150cm poles, 2 x 90cm return poles, pole joiner, corner sections x2, 4 corner section brackets, 3 standard brackets, 40 passing rings and 4 standard rings. The Swish Elements Belgravia curtain pole offers a bay curtain pole solution for bay windows up to 400cm. A ball style finial is available on curtain poles in a satin steel, graphite, chrome or antique brass finish. 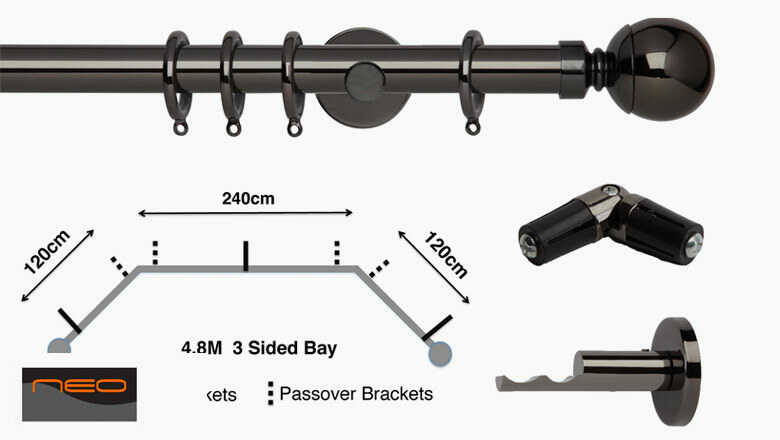 The bay pole kit includes: 1 x 200cm pole, 2 x 100cm poles, 4 x passing brackets (2 for either side of the corners), 3 x standard brackets (1 for each end and 1 for the centre of the bay), 2 corner knuckle joints, 4 standard rings and 36 passover rings and 2 ball finials. The Rolls Neo curtain pole range offers fantastic versatility, which means it can be used for all sorts of window shapes. The added value components in this range is a real step up from the high street / DIY specification of components. We have pulled together pole sets for 3 and 5 sided bay windows on our website at a length of 480cm. The Neo bay window curtain poles are available in a 19mm, 28mm and 35mm diameter. However, as the range is mix and match please do get in touch if your window needs different sized poles, or more corner joiners etc. and we can pull together a bespoke quotation for your requirements. If you can email your window sizes to sales@thehomeofinteriors.co.uk we can send a quotation to you. The Neo bay window curtain pole is available in a 19mm, 28mm & 35mm diameter and comes in a stainless steel, chrome, spun brass or black nickel finish. The full range of Neo finials are available on the bay window curtain poles including the Neo Premium range of lead crystal finials (28mm & 35mm only), the Neo style range of glass & mosaic finials (28mm & 35mm only) & the Neo Oak ball or stud finials (28mm or 35mm only). The Swish Design Studio bay window curtain pole range is a popular choice. The full range of Swish Design Studio finials are available on the bay pole kits and available in satin steel, chrome, antique brass and graphite and they are available in a 28mm and 35mm diameter. 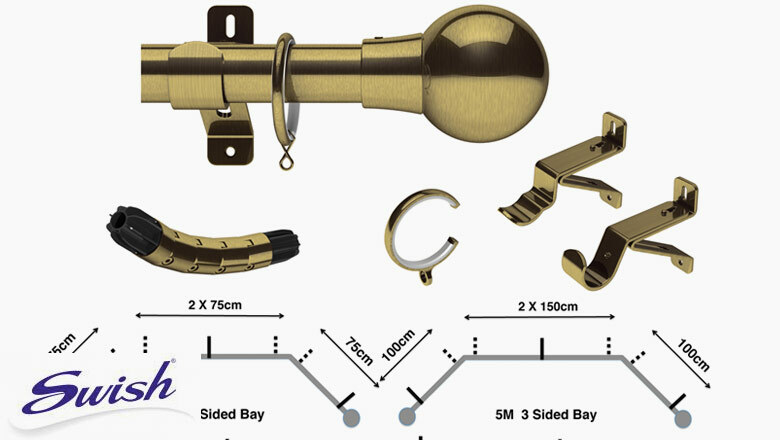 The Swish Design bay window curtain pole kits are suitable for 3 sided bays and come in 2 different lengths: a 300cm kit is available and a 500cm kit. A key feature of the Swish Design Studio bay pole kit is the design of the corner piece which features 4 knuckle joints enabling a more gradual curve, particularly useful for 90 degree bends. This enables a smoother glide around the corners. Reverse bend kits are also available in this range. 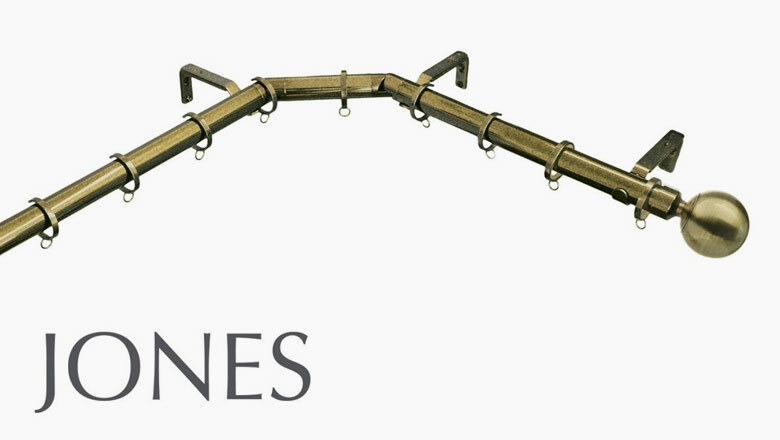 These enable you to bring the pole out of the bay and back along the straight sections of wall. This can be useful if your windows go right up to the end of the bay and you want to stack your curtains back onto the return walls to enable as much light into the room as possible. A 30cm section of pole is included in the return bay pole kit along with one passing bracket and a bay corner piece that can be reverse bent. Please remember to order 2 return bay kits if you have 2 sides!! 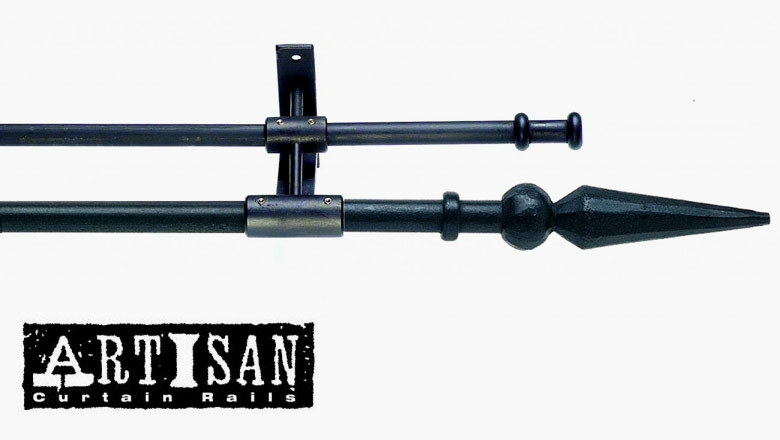 If you are looking for a bay window curtain pole in a wrought iron finish the Artisan range offers a great solution. 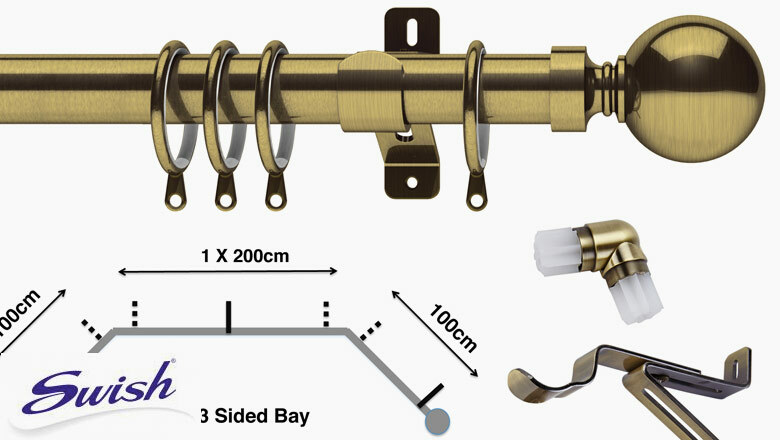 The bay window curtain pole kit is available as a complete set including finials, poles, rings & brackets. It is available in 2 sizes: suitable for bays up to 300cm or 400cm. Both sizes have two poles, which are joined together by a central bracket. Each pole is secured centrally to enable the rail to be bent into each corner of the bay. Rails can be cut down to fit with a hacksaw. 10 rings per metre are supplied as standard. Subject to stock availability all of our bay window curtain poles are available on a next working day delivery service and we offer free delivery on all orders over £95. We pride ourselves on the personal service we offer and are extremely proud of our 5 star Feefo reviews. For more information on our brands and products please see our YouTube channel.